Shaved ice desserts and the year-round steaming hot weather of Southeast Asia go together. No further explanation is needed for that statement. Everywhere you look, you see shaved ice dessert stalls. And always sitting gorgeous in the midst of many, many cold dessert components is Tab Tim Grob (ทับทิมกรอบ). This beautiful dessert stands out. It really does. In fact, if I were to follow the dubious tradition of crowning food items (cf. durian is the king of fruit and mangosteen is the queen of fruit), I’d say this exquisite, refreshing, and fragrant cold dessert more than deserves to be put on the throne. Chestnut dice soaked in beet juice. This is without a doubt one of the most loved desserts in Thailand. An indispensable star component among the vast varieties of nam khaeng sai mix-ins, these ruby red mock pomegranate seeds also hold their own superbly as a stand-alone – something only the most worthy of mix-ins can do. I don’t usually spend much time dwelling on the origin of the name of this dessert. When I come face to face with Tab Tim Grob, I focus more on eating it than analyzing whence the name comes. But here’s what I think. 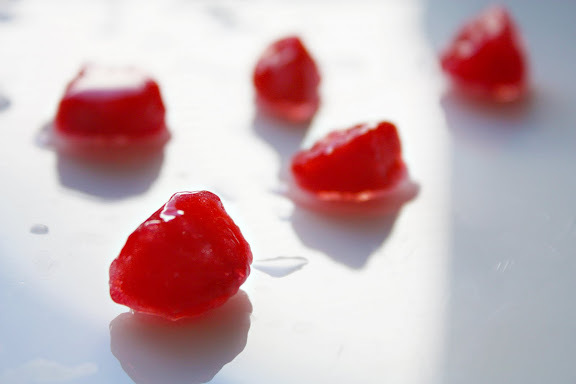 Some people — actually the majority of them — call this dessert, “Red Rubies” perhaps believing that that English designation represents both the Thai name and the appearance of the dessert. Though this is not outright wrong, I think it’s a misnomer. Tab Tim (ทับทิม) is the Thai word which can refer to both ruby and pomegranate (possibly because its seeds are bright red like ruby). So Tab Tim Grob, which literally means “crunchy tab tim,” presents a bit of a challenge: which tab tim is in view here? Does Tab Tim Grob refer to “crunchy red rubies” or “crunchy pomegranate (seeds)”? We’re not going to go into the issue of whether ruby is named after pomegranate or the other way around, as that is irrelevant (though interesting). The question should be: which of these two things is Tab Tim Grob made to resemble? Without going any more deeply into this and putting myself at a risk of losing all of my six readers, I’m just going to say that just by looking at the dessert, it doesn’t take much for one to come to a conclusion that the dessert aims to mimic the seeds of the pomegranate fruit, not ruby. The gelatinous tapioca on the outside of each Tab Tim Grob kernel mimics the edible flesh of a pomegranate aril and the crunchy water chestnut on the inside mimics the inner seed itself. True, the color of pomegranate seeds is ruby red. True, pomegranate seeds look like little red jewels. But first and foremost, this dessert is fashioned after Tab Tim the fruit, not Tab Tim the red precious stone. Had the dessert been intended to be an edible version of Tab Tim the jewel, the color alone would have sufficed and the tapioca layer would have been superfluous. And this is the reason why calling the green version — a new creation — of Tam Tim Grob that is tinted with the juice of pandanus leaf, “crunchy emerald (มรกตกรอบ),” only perpetuates the misnomer. 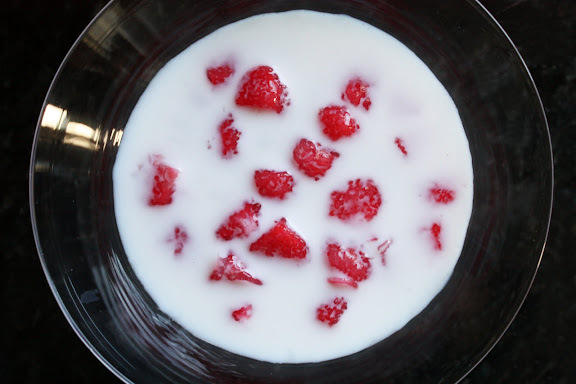 To redirect our focus back to the dessert itself, the intrinsically bland mock pomegranate seeds form a perfect ensemble with the coconut milk-based syrup. Their gelatinous and crunchy texture, when chewed together along with the crushed or shaved ice, also makes for an interesting oral sensation. A dessert that is pretty to look at as well as refreshing and satisfying that also provides a fun eating experience — you can’t beat that. Tab Tim Grob is so easy to make. Any Homo erectus with fire-making skills can produce excellent first-time results. 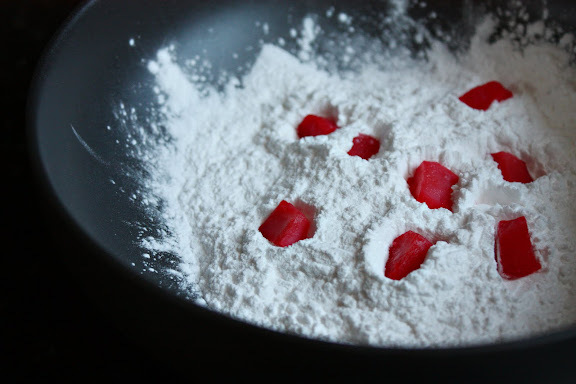 The only difficulty for some, myself included, is getting over the fact that edible — albeit synthetic and chemical-laden — food coloring is traditionally used to achieve the bright red color. If you really can’t get over that, you have two options: 1. omit the red food coloring and end up with a colorless version of Tab Tim Grob which tastes just the same, or 2. use red color from natural sources (fresh beet juice works very, very well). Check out Tab Tim Grob used in a Vietnamese fruit cocktail. Prepare the coconut cream by adding just enough sugar to the coconut milk and keep tasting until the mixture is sweet enough for you. 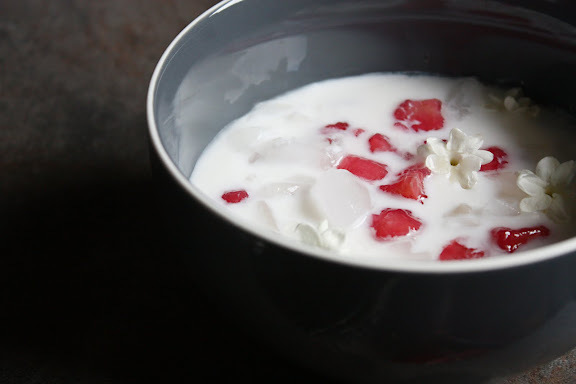 The coconut milk is supposed to be on the sweet side as the mock pomegranate seeds are pretty bland. Also, keep in mind that the ice will dilute the coconut milk somewhat once the dessert is assembled. Add a tiny pinch of salt to round out the flavor. Heat up the coconut milk mixture briefly just to allow the sugar to dissolve; there’s no need to heat it beyond that point. Bring the pot off the heat and let the mixture cool slightly. If using fresh jasmine flowers, add them to the coconut milk and let it steep for an hour or so. If using jasmine or rose extract, just add it to the coconut milk and you’re done; no steeping is needed. 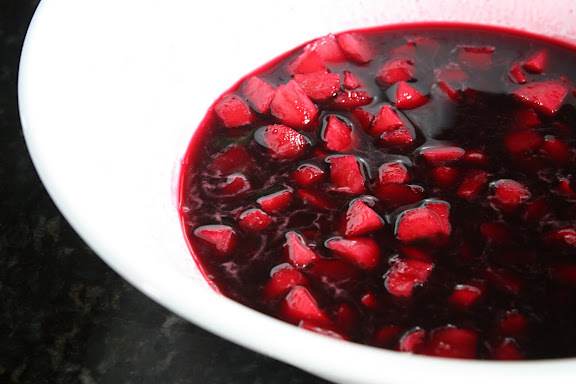 Soak your water chestnut or jicama dice in the beet juice for 5 minutes. You can also tint them with red food coloring. Toss the chestnut dice into a bowl of tapioca starch and make sure each and every piece is coated on all sides. Shake excess starch off of the water chestnut pieces; set aside. Put some cold water in a bowl and place it close to the stove. Bring a pot of water (about 3 quarts) of to a boil (make sure the water is boiling hard). 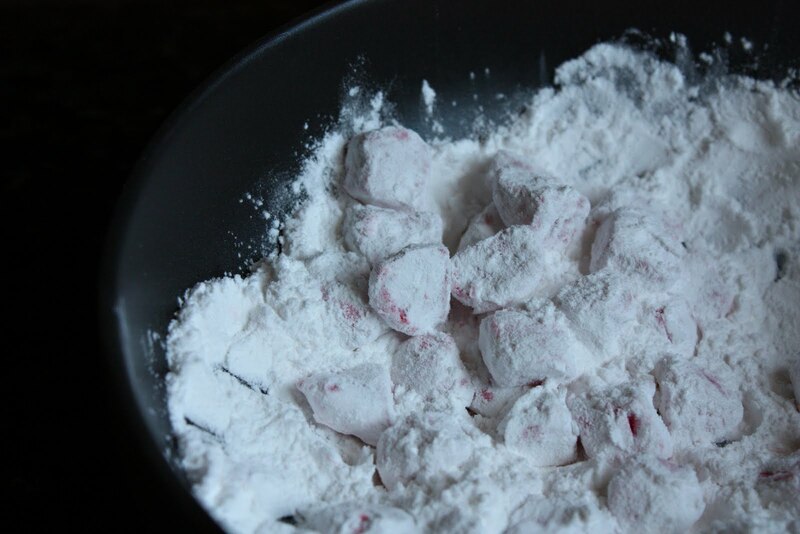 Drop the flour-coated water chestnuts into the boiling water, one by one (to prevent them from clumping up). 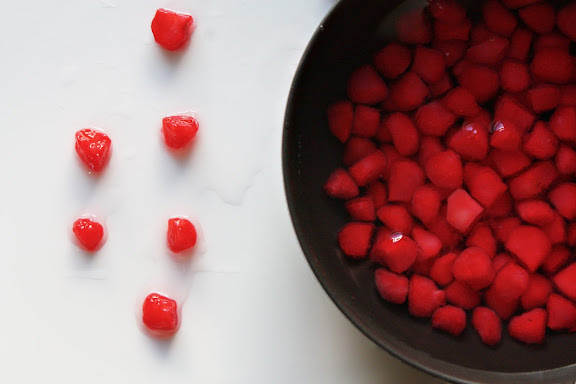 Once the mock pomegranate seeds float to the surface of the water, transfer them from the pot with a slotted spoon into the cold water bowl where they should remain until the dessert is ready to serve. To serve, split the drained mock pomegranate seeds between two dessert bowls and pour half of the coconut cream over them. Top it off with crushed or shaved ice and serve immediately. The official transliteration is Thap Thim Krop. Wow! Lovely. I’ll use beetjuice to color, thankyou. Welcome back!! Glad you made it home safe. I know what you mean about leaving your heart across the globe while physically you’re someplace else. I had the same problem when I traveled to the Philippines last year. That dessert looks so much like a dessert commonly found in the Philippines, too. Probably just a different variation of it. It must be sad coming back to work! Hopefully the dessert is good for jetlag. I love the red against the white coconut, even though it’s a bit artificial. Pretty cool I’ve previously used the Nigella Lawson mhetod with great success: cut in half, turn upside down over a bowl, whack with a wooden spoon until all seeds have fallen out :] Will make sure to try this out at some point! Welcome back! This is really interesting, I’ve never seen this before. I am so glad you had a good time!!! I enjoyed your posts from the road, but I am glad you made it safely back to Chicago. This dessert looks interesting, and really tasty. Beautiful pictures, too. Makes me want to dip in my spoon! Welcome back! Intriguing dessert, love the colors! Welcome back! You must have had an incredible time. I love the color of the ‘pomegranate’ seeds. Beet juice is a good alternative idea though. so glad that you are back! It was fun to live vicariously through your tweets and posts. Thanks so much! I loved this dessert in Thailand, but never saw it in any cookbooks and could not figure out what the coating on the crunchy stuff was, or how it could be made. I’ll have to try it soon. Simple and refreshing sounding – a perfect end to a meal. I cannot wait to try. Welcome back and hope you are readily acclimating. Sounds delicious, I am really looking forward to trying this! Can I ask why this recipe uses mock pomegranates rather than real pomegranate seeds? Is it ever made with real pomegranates, and if so, how does it compare? Anna, no, because the intention is to create something that looks like pomegranate seeds (for aesthetic reason), not taste like them.